* Products or services produced by this company are relevant to my presentation. Gluten tolerization: Nexvax2 • Combines three proprietary peptides that elicit an immune response in celiac disease patients who carry HLA-DQ2 • Similarly to treatments for allergies, the “vaccine” is designed to reprogram gluten-specific T cells • Well tolerated in healthy, HLA-DQ2 positive celiac patients • A clinical trial to evaluate the Safety and Tolerability is currently recruiting patients • Open questions: (1) does the peptide vaccination tolerize gluten-reactive T cells in the intestinal mucosa, and (2) to what extent does this acquired immunity extend to less immunodominant epitopes? 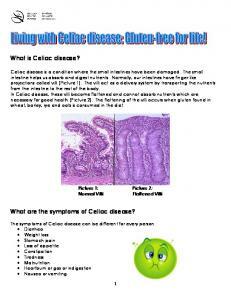 Report "Celiac disease: novel therapeutics"